Object: To explore a jungle of cards and duel over arms that will aid in final showdown with your opponent. The game is played on a playing field of cards, which represents the jungle. Players explore it by removing cards from the jungle and fighting over them. Eventually, one player challenges the other to a showdown, in which each player's winnings are pitted against each other. Shuffle two decks of cards together and deal four cards to each player. Then, deal the jungle according to the following diagram. The jungle should be placed to the side and oriented sideways between the two players, so that both players have equal access to it. The remainder of the deck is set aside as the stock pile. Space should be left next to it for a discard pile, which is initially empty. Play consists of two phases, an exploration phase and a final showdown. The winner of the showdown phase wins the game. Players take turns "exploring" the jungle, represented by the playing field of playing cards. On a player's turn, he may either attack or explore. He can only attack if there are no more face-up cards in the jungle; if there are no more face-up cards and there are eight or fewer face-down cards left in the jungle, he must attack. In the event of an attack, the exploration phase is over, and the game advances to the showdown phase. When a player explores the jungle on his turn, he selects one card from the jungle that is accessible (i.e., not partially covered by any other card) and moves it (face up) to a central area between the two players. This card, called the treasure card, will be fought over by the two players; the winner will get to keep it. Play begins with the player who selected the treasure card. He opens by playing a card in his hand to the discard pile. This is called the lead card. His opponent then plays a card from his own hand on top of it; he must follow suit if possible but may otherwise play any card. This is called the response card. If both the lead card and response card are of the same rank, it's as if neither were played; the first player plays a new lead card to the discard pile, and the second must play a new response card (again, following suit if possible). If the response card is of lower rank than the lead card (aces ranking high), the player of the lead card wins the treasure card. He takes the treasure card and lays it face up in front of him. If the response card is of a higher rank and of the same suit as the lead card, the player of the response card wins the treasure card. He takes the treasure card and lays it face up in front of him. If the response card is of a higher rank but different suit, this card becomes the new lead card, and the first player must play a response card on top of it, following suit if possible but otherwise playing any card from his hand. If either player runs completely out of cards during the course of a duel, he immediately draws four more cards from the stock pile to replenish his hand. 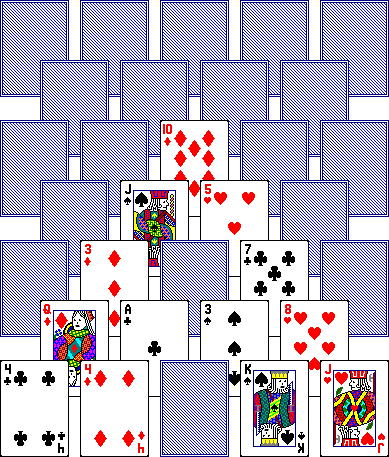 After the treasure card has been won by one player or the other, both players replenish their hands by drawing cards from the stock pile until they have four cards in their hands again. If the stock pile becomes exhausted, the discard pile is reshuffled to replenish it. Each player stores the treasure cards he has won in battle face-up in front of him, fanned out and visible to both players. The remaining face-down jungle cards are gathered together and dealt to the players (starting with the non-attacker, so that if there is an odd number of cards left, the non-attacker gets the extra card). These cards are added to the players' hands and kept hidden. The showdown consists of a series of duels, much like the duels over the treasure cards, except that players do not replenish their hands with cards from the stock pile. On a player's turn, he can play a card from his own hand or from the treasure cards he has captured. The non-attacker begins by playing a lead card, either from his hand or his collection of treasure cards, to a discard pile in the center of the table. The attacker plays a response card on top of it (again, he may choose from his hand or his collection of treasure cards). The rules about what is legal to play, when a duel is over, and who wins it are identical to the rules for dueling over treasure cards. When a duel is won, the winner of the duel takes in all cards in the discard pile and places them in a face-down pile in front of him. Each discard pile a player wins must be kept separate, because at the end of the round, scoring is based on the number of duels won, not the number of cards won. If a player runs out of cards in the middle of a duel, the player who cannot play loses the duel to the other player. Once one player or the other has no more cards left, either in his hand or his collection of treasure cards, no further duels are fought, and the showdown is over. The player with cards left counts one point for every three cards he still has, rounding down. Then each player counts one point per duel he has won. Whoever has the most points is the winner of the game. In the event of a tie, players gather up all the cards they have taken in duels, plus any unplayed cards, and duel a second time, this time with all cards held in hand and kept hidden from the other player. If this round also results in a tie, there is no further tiebreaker; the game as a whole is counted a tie.